CLASSIC ACCOUNTS – A telephone betting account opened with a minimum of $10. This account allows you to bet up to the amount you have on deposit using our operator-assisted, toll-free 800 lines or our Autobet service. VIP ACCOUNTS – A telephone betting account opened with a minimum of $300. This account allows you to bet surcharge-free (payoffs are at the same prices as at the racetracks). A minimum of $300 must be present in the account at the beginning of the wager to bet surcharge-free. Both Classic account and VIP account holders may deposit money in their accounts by mail or at any Western Regional Off-Track Betting branch. Alaska, Arizona, Colorado, Connecticut, Georgia, Illinois, Hawaii, Minnesota, Mississippi, North Carolina, North Dakota, Nevada, New Jersey, Pennsylvania, South Carolina, Texas, Utah and Virginia. OR – Drop off your application with your deposit at any of our conveniently located OTB branch offices throughout Western New York. OPERATORS ARE AVAILABLE TOLL-FREE AT 1-800-724-4000 TO ASSIST YOU. MAIL – Checks and money orders can be mailed to Dial-A-Bet, 8315 Park Road, Batavia, New York 14020. Checks for $50 or less are added immediately upon receipt. Amounts in excess of $50 take three (3) days to clear. BRANCH DEPOSIT – Deposits can be made at any Western OTB’s 32 branch offices. Cash deposits, money orders and checks for $50 or less are added immediately to your account. Checks in amounts exceeding $50 take three (3) days to clear. WHAT TRACKS CAN I BET ON? Western Regional Off-Track Betting offers a large variety of daily racing. To find out which tracks are available, click on our CALENDAR PAGE. Post times are all listed as EST (Eastern Standard Time). WHAT IS THE PROCEDURE FOR MAKING A BET? OPERATOR ASSISTED – Call 1-800-724-4000 An operator will ask for your account and pin number. The operator will give you your account balance and ask you for your first bet. The proper order in placing your bet is as follows: Racetrack, Race Number, Bet Amount, Type of Bet, Horse Number (s). The operator will read your wager back and ask you if this is correct. If you say yes, the transaction is complete. If you indicate that it is incorrect, the procedure is re- entered until you are satisfied. AUTOBET – Using a touch-tone phone, call 1-877-394-6817. This service allows the customer to place his/her bets by dealing directly with a computer using toll-free lines. HOW DO I KNOW THAT I RECEIVED THE BETS THAT I HAVE REQUESTED? All bets are recorded. The recording is cross-referenced to our computer records. WHAT ARE THE TELEPHONE BETTING HOURS OF OPERATION? Telephone Betting is open from 10:30 AM – 5:30 PM (EST) Monday & Tuesday; 10:30 AM until 10:00 PM (EST) Wednesday – Saturday; and Sundays 11:30 – 4:30PM (EST). Auto bet is online up until the last race of the last track. CAN I AVOID PAYING THE 5% SURCHARGE? If you open a VIP account and maintain a $300 balance (at the time of your wager) you can eliminate the surcharge on your bets. A Classic account can be upgraded to a VIP account by having a minimum balance of $300 and asking an operator to change your account to a VIP. Winnings are automatically posted to your account after each race is official. These winnings are immediately available for future wagers. Request a check sent out next business day. What if I have other questions about your Telephone Betting service? Call 1-800-724-4000 and our management staff will be happy to assist you. This system allows the customer to place bets automatically without speaking to an operator. A touch-tone telephone is necessary for the use of this system. Enter your Account Number followed by the # sign. The AutoBet system will state your account balance. 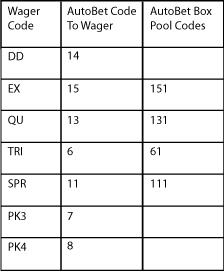 To enter a “box” wager, enter a “1” after entering the pool code. For example, an Exacta Box will be entered as “151#” and a Trifecta as “61#”. Separate dollars and cents with the * key. To select the minimum wager, enter ** followed by the # sign. Enter the Program number of your horse(s) followed by the # sign. If more than one runner is selected, enter them in order separated by the * key. If all runners are selected, enter 99 followed by the # sign. If your wager is read back to you incorrectly and you accept it as read, the incorrect wager is what is placed in the Tote system. You will not be entitled to a refund or payout on a wager that you accept after it has been read back to you incorrectly. If your wager is incorrect, select the option to correct your wager. It is your responsibility to confirm your acceptance of the wager. If you do not confirm the wager, it will not be placed. 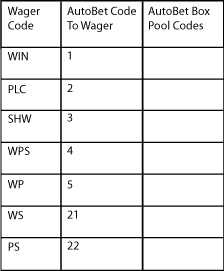 Once you accept the wager, the Auto Bet system will attempt to place it. If the wager is not accepted, the Auto Bet system will notify you. You will not be entitled to a refund or payout on a wager that is not accepted by the host track. Listen carefully to make sure your wager was accepted. Once your wager has been accepted, you may hang up or place another wager. *Please be sure to allow ample time before the start of the race to place your wager. 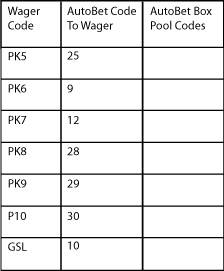 It is your responsibility to place your wager before the pool closes. You will not be entitled to a refund or payout on wager that is not placed because of a technical problem, early closure of a pool by a host track, etc. To bet with an Operator Dial 1-800-724-4000. There is a 12½ cent charge plus any toll charges outside the Rochester calling area. Please remember to dial “1” before the area code for those calls originating outside the (585) area. Customers with an active telephone betting account may call the toll-free 800# for race results.